hvac tools. Condition is Used. Dispatched with Royal Mail 1st Class. It is currently connected for 110v use and has a yellow 110v plug attached. However this can be removed and a standard 240v 3 pin plug fitted. This has been used solely by myself and has always been capped after use. Fl ar in g ki t as n ew a nd w il l alsot hr ow in a go od quality ni tr o gauge. Has a ball valve that can be opened and closed in just a quarter-turn rather than a stem-type valve. Suitable interface:1/4"&5/16". You can remove valve cores quickly and easily. Work on service valves cores of booth 1/4" and 5/16" service ports. 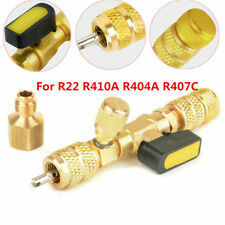 1x 1/4" and 5/16" Valve Core Remover Installer Tool for R32 R410. Has a ball valve that can be opened and closed in just a quarter-turn rather than a stem-type valve. Suitable interface: 1/4"&5/16". You can remove valve cores quickly and easily. Then add the fluorine safety valve screwed on the air conditioning valve. RED = R410A. BLUE = R22. Approved for R22 refrigerant. 1 Pc X R410A Valve. 1 Pc X R22 Valve. safety valve stem thimble will move forward the air valve in the valve stem valve connected to the pipeline. Suitable for cutting and flaring copper, brass or thin walled aluminum tube. - Designed for pipe flaring and can be used to make flares. 1 Set of Flaring Tool Kit. - Pipe Tube Cutter Capacity: 3-28mm (1/8&＃39;&＃39;- 1-1/8&＃39;&＃39;). Conex Banninger B-PRESS MAXIPRO 3/8 straight couplers. For use with rothenberger press tool. Brand new and sealed. Air conditioning press fittings. Conex Banninger B-PRESS MAXIPRO 3/8 Elbows pack of 5. Rated to 48 bar. For use with rothenburger romax press tool. Other sizes available see description for details. 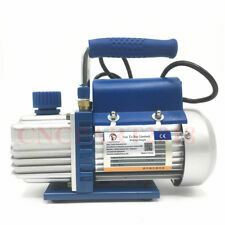 J/B ELIMINATOR VACUUM PUMP 142 L/MIN. Just Better (JB). Ultimate Vacuum: 25 Micron. Supplied with: User manual and 946 mL bottle of vacuum pump oil. Large feet to prevent roll over. Motor size: 1/2 HP. 1 set x valve core remover. Has a ball valve that can be opened and closed in just a quarter-turn rather than a stem-type valve. Remove and install the valve core without the loss of refrigerant. Remove valve cores quickly and easily. Heavy Duty and Easy to use. Perfect for regular use on bigger A/C or Refrigeration HVAC Installs. The image shows what the UK price is now for a Plumbers kit. Rarely used. Like new other than rusty case. Refrigeration Torr Gauge Supco. Come with a magnetic strap for securing to systems while working on them also has a built in hook for and alternative use. This digital gauge is fully operational and has a bright backlit screen for easier reading whilst working. Condition is Used. Dispatched with Royal Mail 2nd Class Recorded. Sturtevant richmont Torque Handle CCM-150. Condition is New. These have never been used . 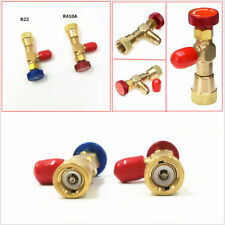 1Pc AC Refrigerant Brass Tap. Thread jointed to Refrigeration tube : 1/4SAE. Material: Aluminum. Note: Due to the difference between different monitors, the picture may not reflect the actual color of the item. The network-capable PXM20 operator unit allows for homogenous operation of a multitude of building services plants at the automation level. The PXM20 can be used on-site or remote for all plants connected via a network. Pipe Tube Expander Steel Mandrel Manual Pipes Expanding Tool for Air Conditioner Refrigeration Install Maintain Repair. 1pc x Hand tube expander tool. Scope of application: applied into soft copper, soft aluminum tube, soft stainless steel tube, from 3/8" to 1-5/8" tube. Marked as 3/4" af but as the differences between 3/4" & 19mm is so minuscule this would be perfect for 19mm heads. Vintage Made In England Leytool 3/4" Or 19mm Inch Ratchet Spanner HVAC Tool. Condition is Used. Dispatched with Royal Mail 1st Class. H as b ee n in s to ra ge a nd i s no w surplus. A ny q ue st io ns, pl ea se f re e fr ee t o as k.
Fan Wheel Puller. Use genuine OEM parts for safety reliability and performance. If there's a problem, just let us know and we will fix it. V er y nicerecovery un it a nd g oo d quality. 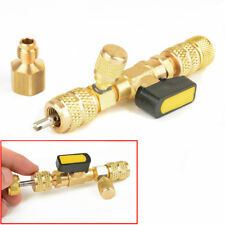 1Pc AC Refrigerant Brass Tap. Thread jointed to Refrigeration tube : 1/4SAE. Length: 6cmx3.5cm. Material: Aluminum. O Contents: 1 Piece Of Rothenberger TORQUE WRENCH. o ROTORQUE REFRIGERATION is suitable for cylinder heads work. o Always fits, covers all flare nut sizes from 15-32 mm. o Torque (from): 10 Nm. Photos are for illustrative purpose only. Sundely 1/4" and 5/16" Valve Core Remover Installer Tool for R32 R410. Type：Valve Core Remover Installer Tool. Has a ball valve that can be opened and closed in just a quarter-turn rather than a stem-type valve. 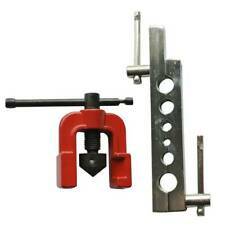 Sundely 1/4" and 5/16" Valve Core Remover Installer Tool for R32 R410. Type：Valve Core Remover Installer Tool. 1 set x valve core remover. Has a ball valve that can be opened and closed in just a quarter-turn rather than a stem-type valve. Part Number: MAPP GAS 400g. Gas Type: Propylene, isobutane and propane mixture. Connection: CGA 600 Thread (1" - 20 UNEF). O Contents: 1 Box Of Rothenberger 4-WAY MANIFOLD KIT & HOSES. Manifold set and charging hoses. o Manifold. o 3 x 1.500mm Pressure Hoses. o Pressure gauge with 80 mm. o Plastic Carry Case.